It was the last day of 2009 and what a better way than to help needy dogs at the county shelter. There were quite a few dogs today, definitely more than last week. Not sure if these dogs were new or brought back from their foster homes. Either way, they needed some love and care with the short staff at the shelter. 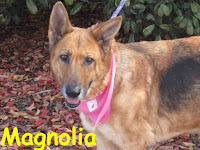 Nonetheless, Magnolia desperately needs a second chance home. When I took her out of her kennel, I was surprised how energetic she was. We interacted out in the courtyard. She really doesn't play with toys or fetches a ball, but she absolutely loves affection and being brushed. One year-old Bear, a Chow-Chow Siberian Husky mix is a beautiful dog. 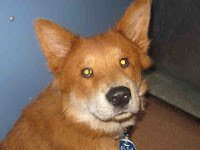 He's rather calm for a Chow but his red thick coat represents his breed. Bear and I went for a walk around the gardens - he was easy to handle. Bear would make a great family pet. 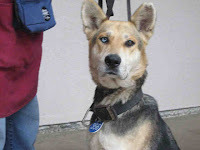 Isis is a black and tan Shepherd Mix who is 4 years old. She is a large dog who likes to be outside. Isis needs a lot of love and kindness. As I interacted with her, I noticed that she has had a rough life at her young age. She is extremely thin (perhaps once emaciated) and has remnants of wounds that are now healed. It appeared to me that Isis looked as if she was used for breeding. I gave her a massage which she loved. I could sense that her achy muscles felt better. Isis needs a quite, calm home to make her feel love and at peace. Jane doesn't have a picture but she is a cute 2 year-old black and white Boxer blend. As we walked she was pulling on the leash but as soon as I told her to heal, she did slow down. We decided to stop and sit on the steps for a while. For a good part of our time together, Jane laied on her back and I rubbed her belly - she LOVED that! I'm so happy for these pets. I just hope that they have found their forever home. I will be volunteering again this week - stay tuned for an update!